July is National Ice Cream Month. To celebrate, we&apos;ll be reviewing some of our favorite ice cream spots — and some new ones, too — all this week. How does one translate a poem? Is it any easier than recreating rich, fragrant Persian ice cream (Gol-o Bolbol in Farsi) for Angelino palettes some seven thousand miles away from the source? 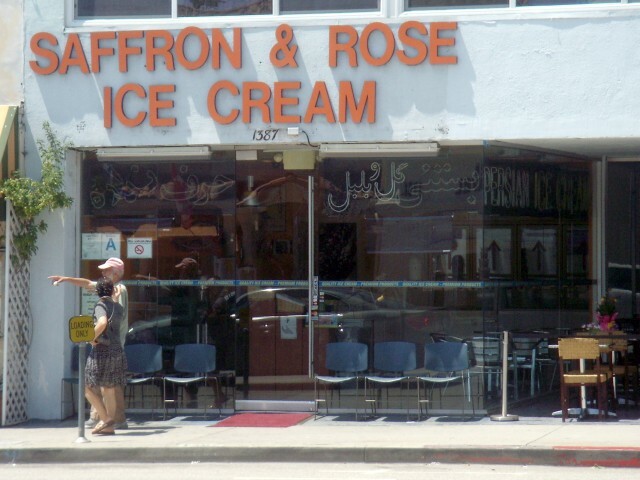 The staff at Saffron and Rose Ice Cream in Westwood seem to think so, to the city&apos;s certain benefit. Located in the heart of Tehrangeles, each evening Saffron and Rose serves as a meeting place for UCLA students, curious foodies, and homesick Persians. It&apos;s not the most glamorous location, devoid of parking, surrounded by shuttered shops and an eyesore of an empty Borders across the street. Yet on a recent weeknight, the place was packed. While the staff tries out new flavors like cranberry every so often (all created in an off site creamery in LA), it&apos;s the standbys that attract the crowds. The white rose ice cream is rich in flavor and fragrance, its sweetness concealing a tender aftertaste, satisfying my nostalgia for an imagined Persian childhood. The saffron and pistachio ice cream is another favorite—warm and piquant, it packs a delicious crunch. While most may know saffron only as a spice for rice, its sweeter side is equally exciting. I found cucumber and strawberry a refreshing combination. The sourness of the cucumber matched with the sweetness of the berries. Unlike store bought strawberry ice cream, you can taste the organic strawberries they pack in each scoop. I also tried the lavender, which follows the lead of its more popular cousin, white rose, but is less flavorful. It left me underwhelmed. Saffron and Pistachio, Poppy Seed Slush, and Lavender Scoops. Every order comes in cups and can be paired with wafers per tradition. The shop also offers varieties like the faludeh, noodles seeped in rosewater, or the poppy seed slush (a winner on a hot summer&apos;s day) which feels suited to cups not cones anyway. Gol-o Bolbol, unlike its American cousin is creamier and contains ice nuggets, which may off putting but are really delicious. For the brave, there are authentic condiments like lemon juice, but they did not seem very popular on the evenings I went. You may lose the thread trying to translate a classical Farsi Ghazal, but this LA breed of Persian ice cream holds its own among the American refreshments. Honestly, I&apos;ll skip the sonnet and go straight for the poppy seed slush.